The Art of the Matter features works on paper and canvas by Redland Yurara Art Society members. Members were asked to explore their perspective on topics important to them individually, and were encouraged to translate and communicate the heart of the matter to the viewer, all within the overall size of 30 x 30cm. 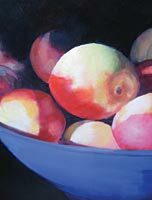 Image: Ellen Paxton, Nectarines (detail) 2010, oil on canvas. Courtesy of the artist.